The Jazz hybrid has revised headlights, a new front grille, restyled bumpers and a chrome tailgate. Honda will debut a hybrid version of its Jazz/Fit small car at the Paris auto show and launch sales in Europe early next year. The automaker said the Jazz hybrid will be the world's first small-segment hybrid. The car has the same engine as the Honda Insight hybrid -- a 1.3-liter gasoline engine combined with a CVT, with an electric motor sandwiched between the two to create a parallel hybrid system. 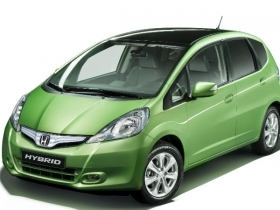 The hybrid Jazz – like the Insight and Civic Hybrid models – will be capable of running on the electric motor alone under some medium and low speed conditions, Honda said in a statement. Despite being taller than the Insight, the Jazz hybrid has comparable fuel consumption and CO2 levels, Honda said, adding that it will release fuel usage and emissions data at the Paris show. The Jazz hybrid has new features that differentiate it from the current Jazz including revised headlights, clear rear lights, a new front grille, restyled bumpers and a chrome tailgate. Inside, the cabin is also given a fresh look, with darker single color dashboard. The new hybrid is also available with leather trim, the first time this has been available on a Jazz model in Europe. The five-door hatchback is sold as the Jazz in Europe, Africa and the Middle East and as the Fit in North and South America, China and Japan. American Honda executives have said that there are no plans to sell a hybrid Fit in the U.S. market, because the Insight already fills that vehicle size and price point.